The Event Horizon Telescope Project Seeks To 'See' A Black Hole : 13.7: Cosmos And Culture A project called the Event Horizon Telescope is analyzing data taken earlier this year using interferometry — and we may be remarkably close to "seeing" a black hole, says astrophysicist Adam Frank. 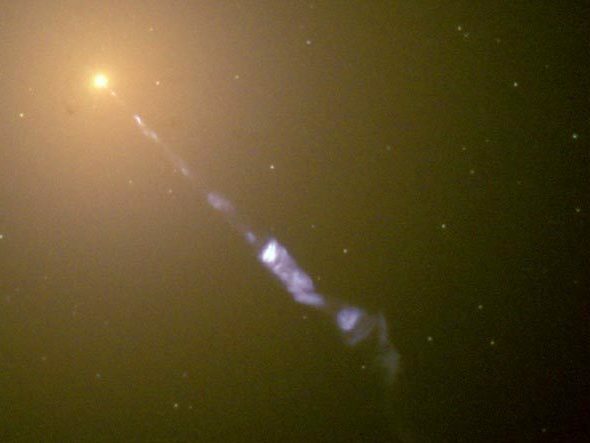 A jet emanating from galaxy M87 can be seen in this July 6, 2000, photo taken by the Hubble Space Telescope. If there is one thing science is good for, it's going to extremes. A lot of science's history is just one story after another of people figuring out how to do something that, just a few years before, was thought to be impossible. The impossible was heavy on my mind last Wednesday as I found out just how close we were to seeing — as in taking actual pictures — of black holes. Charles Gammie is a computational astrophysicist. Like me, he uses supercomputers to simulate the behavior of fluids in space (i.e gases or plasmas). Unlike our group at the University of Rochester, however, Gammie's research group studies black holes and the spinning disks of gas that form around them. I consider him to be one of the best of my generation of computationalists. On top of that, he's also a really nice guy. It was during his visit last week that I learned just how far a project called the Event Horizon Telescope (or EHT) has gotten in the project of seeing black holes. Black holes are massive compact objects. They're places that have been overwhelmed by gravity. And gravity — in Albert Einstein's Theory of Relativity — is the curvature, the stretching, of space and time. A black hole has two basic parts: a singularity at the center where all the mass is crushed into a single point and an event horizon farther out that surrounds the singularity. As most folks have heard, not even light can escape the event horizon. Black holes are the X-games of physics. They represent an unexplored extreme of space-time. While we now have good indirect evidence that they exist, getting a direct view of a black hole is the ultimate dream for a lot of physicists. But how can you see a black hole if even light can't escape its gravitational grasp? While matter crossing the event horizon is lost to this universe, it is possible to orbit a black hole without falling in. Many black holes are surrounded by swirling Frisbees of gas called "accretion disks." The matter in these disks emits light that can escape and reach our telescopes. The Event Horizon Telescope that Charles Gammie described in his talk at our department of physics is designed to see the "shadow" a black hole's event horizon casts on its accretion disk. Calling it a shadow, however, is not quite accurate. The space-time around the event horizon is so strongly curved that it's actually possible to see parts of the disk behind the black hole. Like a fun-house mirror, the image from the disk is highly distorted with a dark region near the center. Seeing that dark region constitutes seeing the event horizon. But getting such an image means pushing telescope technology to its limits. The size of a black hole event horizon scales with its mass. A black hole the size of the sun would have an event horizon about a mile across. Good luck seeing that across the depths of space! Luckily, there are "supermassive" black holes at the centers of galaxies that are millions or billions of times heavier than the sun. These are what the EHT is targeting. The current plan focuses on the relatively small but "nearby" supermassive black hole at the center of our galaxy and the distant, but extremely massive, black hole at the center of the galaxy M87. But while the event horizons of big supermassive black holes are relatively large (about the size of a solar system) the EHT's two targets are still very, very far away. Imagine using a telescope in New York City to make an image of a quarter in Los Angeles that was so good you could read the text on its face. That's the challenge EHT scientists face in imaging a black hole. To overcome this challenge, they are pushing their technology to new extremes. When you point two electronically linked telescopes at the same object, what you get, in essence, is a bigger telescope. Bigger telescopes have more resolving power so they can see smaller things on the sky. Combining the light from the telescopes is what's called interferometry — and it's remarkable and complicated. There are radio telescopes in Chile, Mexico, Spain and the South Pole that are all in on the EHT project. The EHT uses these instruments, stretched across the globe, to get the highest resolving power possible. So how close are we to seeing a black hole? Remarkably close, perhaps. The EHT team is in the process of analyzing data taken earlier this year. Given the complexity of joining observations from so many telescopes, it likely will not be until December that they know what they have. That's when we'll know how far our extreme efforts have taken us toward seeing the extreme.